You don’t realize it when you’re a kid–or when you’re a grownup for that matter–but the biggest night of boozing and partying in the calendar year isn’t St. Patrick’s Day or New Year’s Eve. It’s the night before Thanksgiving. If you come from a podunk town like I do, you know that ninety percent of your childhood friends have gone away to school or simply moved away from said podunk town. But they’re going to come home for Thanksgiving, and, knowing they’ll spend all day tomorrow with their families, are looking to spend some time away from their families tonight. Enter the local tavern owner, ready to oblige. 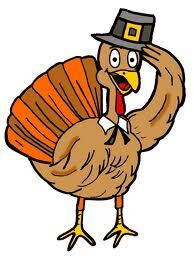 The odd thing about the night before Thanksgiving is that is still is Wednesday. Yes, it has the feel of a weekend, but it’s still a Wednesday for God’s sake. Whereas bars might be able to get away with serving later than one a.m. on New Year’s Eve, on Thanksgiving Eve it’s still a dead stop at one o’clock. That means whatever you’re doing you’ve got to finish by one. That serves only to accelerate the ridiculousness of the evening. Well, Phase One at least. I was reminded recently that there used to be this thing called Phase Two. This year I’m happy to say I won’t be involved in any phases. I’m definitely more towards “grownup” on the subject of Thanksgiving Eve. (Though I’ve seen quite a number of ridiculous “grownups” out on Thanksgiving Eves past.) Tonight I’ll be home with my wife and cats in my new hometown, blissfully unaware of Binghamton shenanigans. Furthermore, tomorrow I’ll actually get to watch the Macy’s Thanksgiving Day Parade, an event I’ve begun watching again after many years of never being up in time to see it. Well, Happy Thanksgiving Eve, everyone, no matter how ridiculous or family-friendly you plan for it to be. Ninety-nine years ago today in the quiet fishing village of Martinez, California, the eighth of nine children born to Italian immigrants Giuseppe and Rosalia DiMaggio entered the world, probably to little fanfare. The fanfare began soon after, and continued to the end of the century. It’s only the truly exceptional athlete who transcends his sport and becomes a national icon the way Joe DiMaggio did, beginning at a very young age and continuing long after his playing days were over. 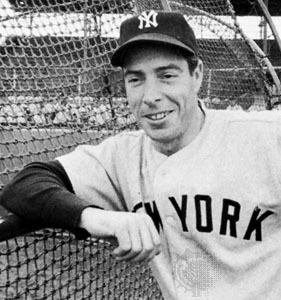 Nearly every man of a certain age considered DiMaggio his favorite player, as did legions of non-fans who knew nothing of the game but appreciated his humble upbringing and grace off the field. In an era in which players’ personal lives were whitewashed by willing reporters and clever PR men, DiMaggio was nothing short of a saint. Even now, a few damning stories and biographies later, DiMaggio epitomizes dignity and professionalism both on and off the playing field. I’ve been a fan of the great DiMaggio since I was seven years old. That was 38 years after he played his final game. DiMaggio in my family, though, held a place similar to that of John Kennedy or the Pope in Catholic families across America. The following is from a piece I composed for a high school writing class at age 16, shortly after Dimaggio’s death at age 84. Few Americans have captivated the nation’s attention like Joe DiMaggio. He played baseball with a grace and style that is no longer found in today’s game. Just as important was his behavior off the field. Uniquely American as baseball is, it seems baseball stars are more than just entertainers; they are our idols. (I think this was even more true in Joe’s playing days.) Many of today’s professional baseball players, no matter how well they play the game, do not portray positive role models off the field. Players are often arrested for drunk driving or caught starting fights in bars (not to mention the dreaded paternity suit). Even seemingly benevolent Mark McGwire sets a bad example for young people: steroid use (ephemerally legal as it may be). Let us not forget Dimaggio’s military service during World War II, costing him three seasons in which he was in his prime. (Many players left professional baseball during the war.) I find it hard to believe that any of today’s players would want to leave their million-dollar homes to fight in a war overseas. The man was married to Marilyn Monroe and played centerfield for the New York Yankees. That’s tough to top. In DiMaggio’s nearly forty-eight years of being retired from baseball, he truly was a living legend. There was something about him that gave him an air of deity. He would go to Old Timer’s Day every year at Yankee Stadium, but in later years he never played. He would be there in a suit, probably throw out the first pitch (as he did quite often), and salute the crowd. That was it. That was Joe DiMaggio. So, “Where have you gone, Joe DiMaggio?” This line, from Paul Simon’s “Mrs. Robinson,” troubled Joe when he first heard it. After all, everyone knew where Joe was: he was Mr. Coffee. Paul Simon met DiMaggio at a benefit once and explained the misunderstanding. The line was not meant to be taken literally. Paul Simon used “Joe DiMaggio” as a symbol for a true American idol (of which we were lacking in 1967 and still are). To me, a more effective lyric would have been, “Where has your style gone, all you American positive role models, such as Yankee baseball great Joe DiMaggio? We need some new role models; not necessarily you, Joe, but someone younger maybe.” However, this line would have been difficult to fit in the song. It’s not as though DiMaggio’s death came as a surprise to anyone. (We had been prepared for it since about September.) In what turned out to be the last six months of Joe’s life, the American public was bombarded with news about his health. Every three days or so, the front page of the Sports section would contain a headline and a brief article about DiMaggio’s condition. There were really only two articles: one said that Joe had suffered a tremendous setback and that the end was near; the other, said that Joe had made a miraculous recovery and would be returning to his newspaper reporter job in Metropolis shortly. (These two articles were run alternately every three days from September to March.) My theory is that we simply wanted to root for Joltin’ Joe one more time. A game is more exciting when it goes back and forth, and that is exactly what the media portrayed. The media (namely, NBC) was also responsible for making Joe’s recovery truly a miracle. (This would come in handy if Joe were ever up for canonization.) For about twenty minutes in December, Joe was dead. The peacocks at NBC were the first to break the story (and, actually, the only ones). The error was rectified when a friend of DiMaggio’s called the company. No one is perfect. Not even baseball gods like Joltin’ Joe. But even flawed gods give us something to root for, perhaps even more so than would infallible ones. I reserve a special place for DiMaggio in my life, the baseball-playing uncle from California I never had. I’m sure I’m not the only one who feels this way. So, here’s to you, Joe DiMaggio, as timeless at 99 as you ever were. 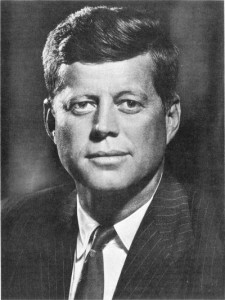 Today, of course, is a sad anniversary in American history: the assassination of President John F. Kennedy. They say everyone alive at the time remembers where he was when he or she first heard the news. Every time I see statistics now about how people heard the news I’m always surprised. Most people didn’t hear the news from Walter Cronkite or their local news reporter, but from friends or neighbors or coworkers who called or told them in person. Amazing that even in the pre-Twitter, pre-Facebook era, most people were already on a 24-hours news cycle, and relied on an old-school “social media” to get their news. Let’s hope we never have to find out what chaos would strike the blogosphere should such an event ever occur again. If Miley Cyrus can bring Twitter to a standstill, I’d hate to think what real news could do. The Kennedys still remain a fascination to us 50 years after JFK’s death, the subjects of books, movies, and of course, blog posts. I count myself among Kennedy watchers (as I am with many historical figures), and will watch this weekend’s tributes with interest. I usually say that I like everything about the Kennedys… except their politics. And with everything I’ve read and heard about that fateful November day in Dallas (and, like today, it was a Friday), I think Oswald was the only shooter present. I would not be altogether surprised to discover, some day, that Oswald indeed discussed the shooting with associates boardering on co-conspirators, but it seems as though ultimate responsibility lies with Oswald himself. I love a good conspiracy as much as the next guy, but I just don’t see it here. That said, remember today that life is short, and one never knows how or when it will end. Spend time with your family and friends, and remember that sometimes life can be so enjoyable. Monday’s post made an oblique reference to a few of my old go-to bits about politicians and your money. I thought it would be both wise and nostalgic to revisit those old friends, always timely and illustrative of so much of the political world. The statements are related, and reveal similar things about the modern statesman. This is one of my favorites regarding transfer payments from one citizen to another (though it’s never described as such by its proponents). Increases in the minimum wage, or any rise in one price without considering effects on other prices, fall prey to this deceit as well. When reading the news today or any day, think about how many times you could substitute the above phrases for what appears as “journalism” or statements from our elected representatives. One thing’s for sure, political advertisements would be a lot more succinct. I tell my students we will examine political science (or history or economics or communications) with disinterest. Of course we may find the subjects interesting, and we may indeed have opinions, but at first study we should set that aside. Say we are considering a certain piece of legislation or economic program. One’s first instinct is to suggest whether it’s “good” or “bad” and therefore whether it should be adopted. The knee-jerk response is actually second-order thinking, and should be reserved for consideration following this: a disinterested consideration of the likely effects. With any change or proposed change one can generally predict who stands to benefit and who stands to lose. Such an honest interpretation would be refreshing from any politician or journalist, but such appraisals are few and far between. One-eyed impassioned pleas are more the standard, touting potential benefits and ignoring potential costs. The current example of national health insurance is but one of a universe of examples hindered by this obstruction. The past four years I’ve tried to take a disinterested view of politics and government. As we are still a (mostly) free people, we have the luxury to do this, a luxury not assumed by peasants of less-civilized places or times. But one of the other benefits of living in prosperous times is the ability of one to profess his views, wise or unwise, founded or unfounded. And with modern technology on my side, I welcome the opportunity to broadcast easily to a potentially large audience. So tell your friends, and revisit often. If nothing else, I hope I can hold your disinterest. When I discontinued this blog in November 2009 it was for one reason: I didn’t feel like giving away anything for free anymore. I gave up the blog, gave up the TV show, and vowed never again to print an issue of The Binghamton Vanguard. Those things were money-losing operations, and I wasn’t making enough money at my regular “job” (whatever that is) to justify their continuation. I’d like to reveal that I now make more money at my regular job and can justify a few whimsical enterprises. I would like to but I can’t. I think, though, that the non-pecuniary benefit of having a blog has risen now to the point at which I find it worth the expense, as I did with the TV show I brought back for a short period in 2011. To date only the Vanguard stands as is. One out of three ain’t bad. I read a story recently from economist Steven Landsburg which described what a young person’s–any person’s–ultimate life goal might be. What’s the goal? What should one’s direction in life entail? To be a consumer. Landsburg’s words, though he says he’s merely quoting a friend: “I want to consume as much as I can of as many different things as I can for as long as I can.” There’s your reason to do anything, including have a blog, paid or unpaid. The event in November 2009 that soured me to unpaid philosophizing was, of course, the reelection of Matthew Ryan as mayor of Binghamton. More specifically it was the defeat of my candidate, Douglas Walter Drazen. I was disappointed to say the least with the Drazen loss, and seeing no hope for Binghamton’s future, I knew by the time the next mayoral election rolled around I’d be long gone. For all my faults in life I do tend to stick to plans, and that one was a case in point. Last week Binghamton elected a new mayor: Rich David. To say he’s a new mayor exaggerates a bit; for several years he was the city’s deputy mayor, and operates in the same circle of Republican cronies that have plagued the city my entire lifetime. These so-called Republicans make the John McCains and Lindsey Grahams of the world look like Tea Party stalwarts, and are, on a local level, the manifestations of why the Tea Party exists. We’ve had our own Republican internecine battle in Binghamton for decades before Ted Cruz and Sarah Palin came along, one of the rare instances in which Binghamton really was ahead of a national trend. Unfortunately it was a bad trend, and our city has been suffering beyond what the average Obamacare malcontent could conceive. My thoughts on Binghamton and its poor governance were codified every week or two for 13 years. I’m going to revisit those ideas in the coming weeks and months, and relate them to national issues. The nice thing about having principles is that you don’t really have to wrestle with new issues that arise. Just apply your principles and the answer awaits, no political considerations necessary. This one is going to be one of our major themes. A major theme of our society the past four years, unfortunately, is a continuation of one that has afflicted us for most of the past century: the growth of government at the expense of personal liberty. The few voices that have emerged recently promoting liberty have been too often mocked by those in political power and worse still by those in the media, ironically the one-time champions of freedom and enterprise. Sadly I see little real opposition to the slow creep of government upon our nation, and sadder still that slow creep seems to be moving less slowly. This being said, there is still no time in human history I’d rather live than in present-day America. With all its faults this is still the greatest nation in the history of the universe. And the fact that I can blog about it whenever I want just makes it that much better. In 1974, Frank Sinatra released an album titled Some Nice Things I’ve Missed, a collection of his own takes on songs released by other artists during his brief retirement from 1971-1973. Having myself been “retired” for the last four years I wonder where to start in revealing content for this site. I’ve written a few things over these past years and I will post them eventually, though sadly most of the “current events” articles one would post on a blog are out of date. Principles, though, never expire. On a personal note, I’ve had a few life changes over the past four years. I got married, moved to Virginia, and bought the house in which I now live. My wife and I also adopted two cats. Those of you with pets know this is a major life change. I still teach and I still play music, and soon I’ll have some song selections available here. For now you can check out Mike O’Connell Meets the Mike O’Connell Trio on Amazon, Spotify, or most other online music sources. Life hasn’t been too bad for me these past four years. I’ve missed having a forum to share the good things. But let’s face it, the reason one has a blog is to rant about things he doesn’t like, and that’s the real advantage to maintaining a presence in cyberspace. Check back on Friday for a few notes on political changes over the past four years, some good, some (mostly) bad, and some, well, the same as they’ve always been. Four years ago I told myself I was giving up blogging because I refused to do anything for free anymore. Well, I still hate to do things for free, but the non-pecuniary benefits of hosting one’s own blog are just to great to resist. I am only human, and a restless human at that. Welcome to mikeoconnelljr.com. This is actually my third website and the second at this address. The first, of course, was thebinghamtonvanguard.com, the electronic counterpart to the print newspaper I began in 2004. In the coming months I plan to upload some of the “greatest hits” of the Vanguard and of the old mikeoconnelljr.com, but I plan to focus much of the content here on my new projects: musical and otherwise. Please check back often for new content on the site. Feel free to comment on the posts or contact me with any questions or suggestions. Read, share, and most of all enjoy!